Eldy_tablet combines the typical simplicity of Eldy with the intuitivity of tablet to offer seniors an useful tool to send e-mails, chat on line, surf the Internet in an easy way. With a simple touch seniors can send an e-mail to their family, chat, video-call friends and parents and access to the Eldy’s blogs and forums to interact with the Eldy community, read articles and actively contribute to the blogs with their writings. Seniors can also inform on health, read the latest news and see weather forecast in a very easy way. Eldy_tablet is compatible with a wide range of new generation Android tablet (for example the Samsung Galaxy tablet, Acer Tablet Iconia, Motorola XOOM, but also the italian Onda Comunication). Eldy-tablet is free, it is optimised for 10 inches, in Italian; soon will be available 7 and 8 inches version and other languages as well. NEW! 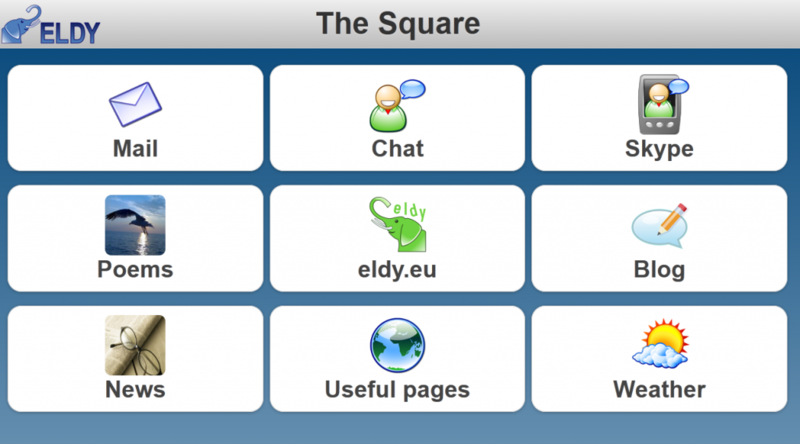 Click here to download the English version of Eldy tablet.